This warm base layer is perfect for those who go where it is really cold and those who just feel really cold whatever the temperature. It wicks, breathes, and dries well allowing it to handle the hot and steamy that cold weather activity can create. Can be combined with other layers as part of a passive insulation system, but excels in active applications. Active fit follows body contours. Sleeves that don't end at the waist and room for broad shoulders or barrel chests. 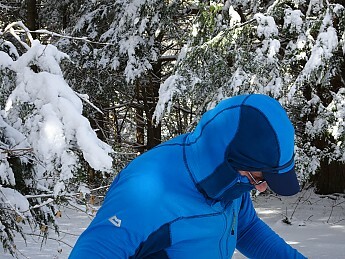 This is a great place to start looking at the Eclipse Hooded Zip T. Mountain Equipment has designed this base layer with an eye to function. The fit is a close, active style cut with the material conforming to individual body shape. 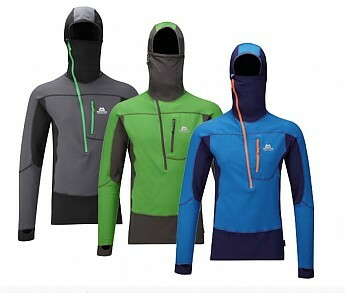 There is a lot of give to both the main fleece panels and the thinner side ventilation panels. 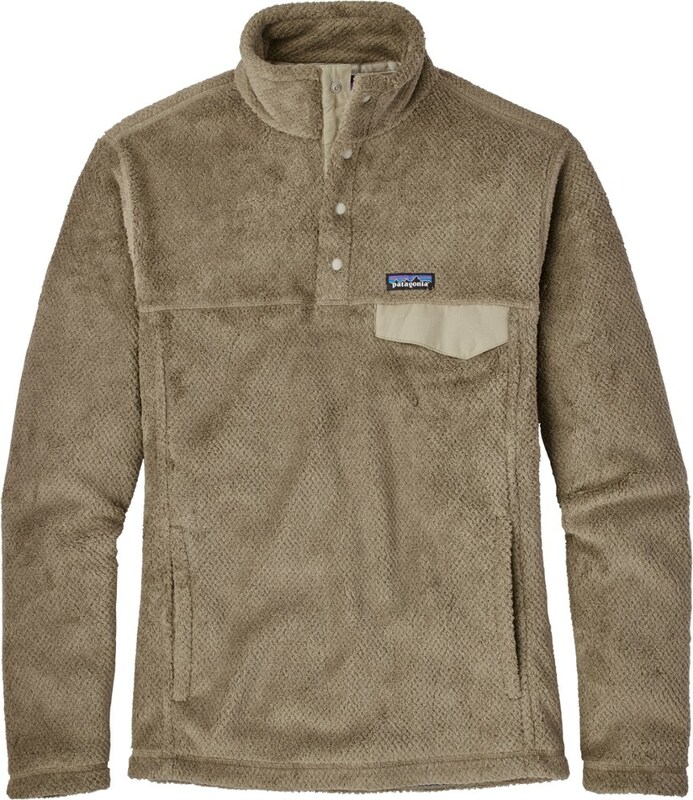 This allows the wicking and insulating features of the fleece to do their job as the material stays in contact with the skin without restricting motion. Fit and comfort will come up frequently throughout this review as they have a lot to do with how the Zip Tee works overall. 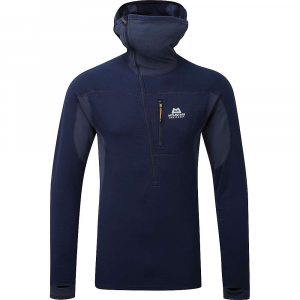 The shape of the panels along with the flexible nature of the materials and stitching let the fleece stay in contact with the body while in motion. Arms can be raised over the head without lifting the bottom hem. The close fit forces vapor through the grid fleece rather than creating trapping pockets of space. 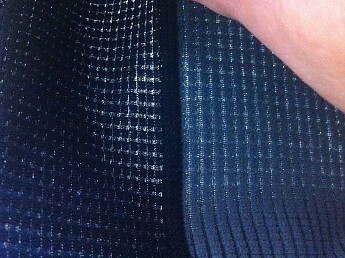 Interior view of both weights of the grid fleece. 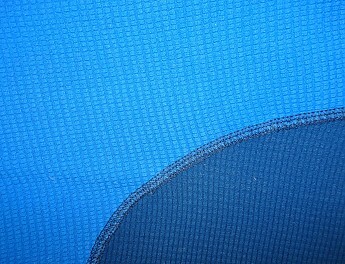 Deep wicking pile with strong grid ventilation. 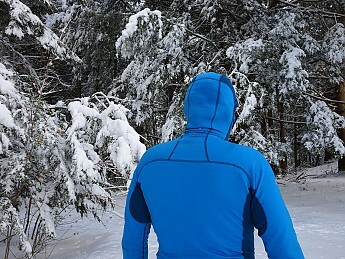 Grid fleece has become popular, especially among cold weather outdoor enthusiasts; because of its ability to insulate while allowing air and moisture movement. The Eclipse is geared towards serious cold weather use which means dealing with excess heat and sweat is about safety as well as comfort. The deep pile of the fleece in the main panels pulls surface moisture away from the skin, even when the material has become wetted. The open porous nature of the grid itself allows vapor venting giving the fleece help in staying ahead of internal moisture buildup. With a light shell to hold the heat the Eclipse was ready to go sub zero for me even with wind. ME markets the Eclipse as a base or mid layer for winter or alpine climbers which means active use in deep cold. This is a somewhat specific type of “warmth” that balances vapor and moisture issues with insulating ability. For that reason I think the warmth of the Eclipse Zip Tee should be discussed at the same time as layering. Given the breathable nature of grid fleece it doesn’t take much of a breeze to blow away any retained heat if it is the only layer you have on. The heat retaining quality of the fleece pile really ramps up if outer layers act as a wind shell. For the Zip Tee that means warmth is definitely related to the layers used along with it. Using a thin wool base layer (WoolPro Skylark Ultralight Crew) under the Eclipse allowed for some additional heat retention, but limited the wicking ability of the fleece. 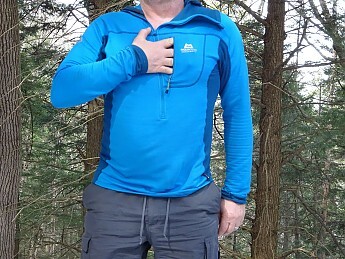 Employing a breathable layer over the top of the Eclipse (Houdini Alpha Houdi) worked better letting the grid fleece do its job directly against the skin and the outer layer adding a bit of wind block while still providing plenty of ventilation. 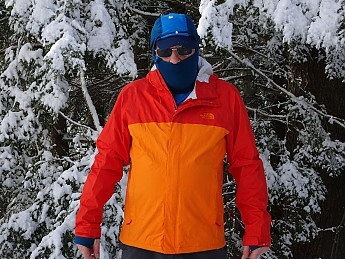 It seems using a full wind blocking shell is what Mountain Equipment had in mind when they designed this layer though. 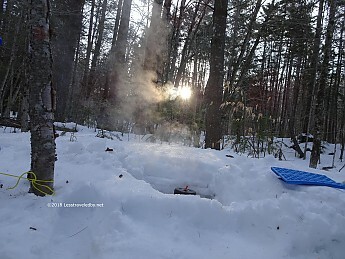 Working hard in extreme environments requires keeping the cold out while letting just enough of the heat and moisture escape to keep you from stewing in your own juices. Inside a shell the grid fleece really shows what it can do, especially if you don’t need to encumber it with any other additional layers. If things do get a bit too steamy the long, offset zipper lets you do a fast release to get things back in balance. During testing I found that this combination worked for me well below zero for active use and additional layers were only needed for inactivity. Maybe the best hood I've ever worn. Really follows the back of the neck. Functional and comfortable with hat, hood, or helmet over the top. Not a lot of bells and whistles to the Eclipse Hooded Zip Tee so its features are pretty much all about function other than the comfort factor. As discussed the grid fleece used does exactly what you want grid fleece to do: wick and breathe. The cut lets the material hug the body in all positions without restriction, including arm pits and back of the neck. The hood is designed to fit directly around the head allowing for helmet or hat to be worn over the top. It wraps closely around the back following the curve of the neck from shoulders to base of the head. The current version of the Eclipse seems to fit more closely and smoothly around the forehead than the older versions. There is enough material to stretch the hood all the way down to the eyebrows without having extra getting in the way when wearing something over the top. Also note the breathable panels across the top of the hood. 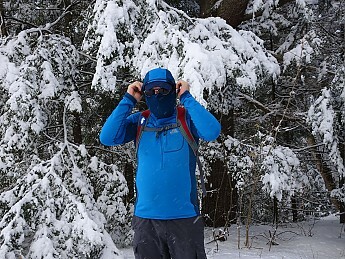 Full balaclava style coverage or partially unzipped for heavy breathing the face mask was easy to convert on the fly to get what was needed as conditions changed. With the front of the hood fully zipped up it effectively becomes a built in balaclava. The material in front of the face is again the lighter weight fleece which allows for easy breathing. Nice for taking the zip down for everyone. Especially nice for keeping the zip away from the beard on the way up for those so blessed. They included a spot to hold the face mask up while pulling the zipper down, which I thank them for every time I use. It is such a little thing, but makes getting the mask off faster and easier, even with gloves on. Cut my head off taking this shot of the "Napoleon" pocket myself because Josephine was busy. Nice spot for glasses, phone, or small camera. The single pocket in this garment is in an easy access chest location. Roughly 6"x5" internally it will hold an average phone or small point and shoot camera. This pocket is not water protected in any way so electronics are not moisture safe, but they are easily reached in this spot. A long, corded pull makes it easy to find and yank in either direction. Thumb holes to keep the sleeves down, but when not used the sleeves didn't tend to ride up. At the end of the sleeves ME added a cuff of the lighter weight fleece which was used to create thumb holes. This thin material doesn’t cause any problems inside a glove and does a great job of keeping the fleece from climbing up the arms. Last but not least, lets take a look at the roughly 20" offset zipper that runs from the right ear towards the navel. Moving the top of the zipper off to the side keeps it away from the lips entirely. This really adds to comfort and function of the face mask portion of the hood. Nice exposure of the neck and chest when fully opened. Plenty of room for heat and vapor exit. The depth of the zipper reaches well down the abdomen; half zip would be a safe term to use despite it feeling more open than that. 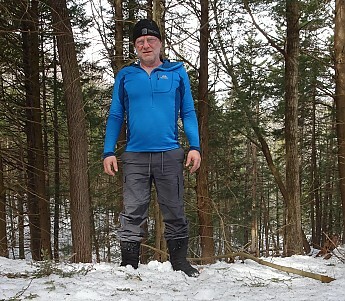 Since this base layer does such a great job of holding heat when wind protected it can be necessary to rapidly vent the excess if a steep pitch has cranked up the internal sauna. Cracking open the shell and dropping this zipper exposes a large portion of the torso letting heat and moisture out fast and letting you close things back up before too much heat turns into too little. Raising and lowering the zipper provided some ability to control internal comfort when hiking at a steady pace as well. Good view of the side panel slightly stretched lets you see difference between the two materials. Note the light showing through the side panel. Both the primary grid fleece and secondary more breathable panels are made of different weights of Tecnopile, products of the Italian company Pontetorto. They have a long history in the woolen industry and now are also known for their synthetic products. 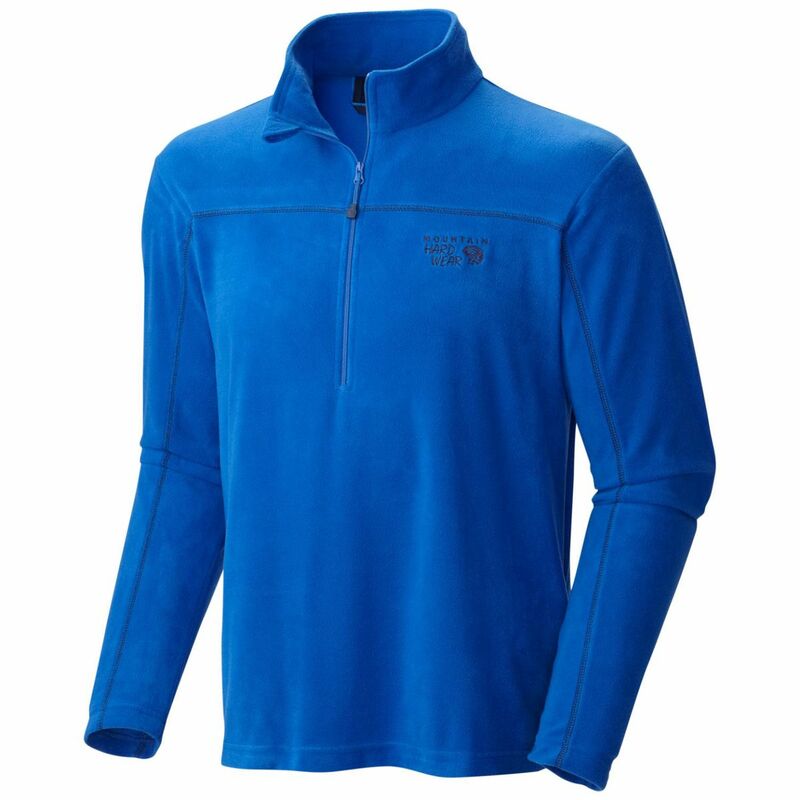 The grid fleece is their Tecnopile 187 while the breathable panels employ their Tecnopile 154. Both of the materials feature Polygiene anti-microbial technology which ME touts as environmentally friendly, Bluesign approved, permanent odor control. Both the primary and pocket zippers are YKK. While the pocket zip includes a long, corded pull for easy use the main zipper smartly does not. When pulled up into a full balaclava position a pull flapping around on the cheek would be annoying so they used simple, short, and wide pull there. The stitching throughout the Eclipse Tee is well done and intended to maximize comfort. There are a few hanging threads on a couple of the stitches, but they have not progressed into unraveling at all. Other than the really large laundry tags there is nothing on the inside of the garment that feels wrong against the skin. As a consumer I would find a way to remove those tags asap. 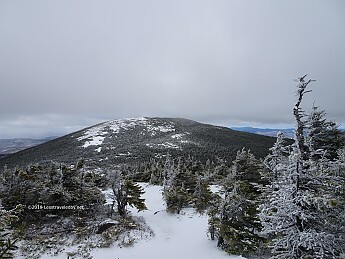 E Baldpate as seen from W Baldpate on the AT in the Mahoosucs near the ME/NH border. ME really jumped the gun and sent me this cold weather product for testing way back in September of last year. Despite the lack of need I tried it on the day it arrived and have been finding excuses to wear the Eclipse Tee as often as I can ever since. I packed it along on my ill fated LT attempt last fall and when the 90° heat drove me off trail I wore this thing to the pub for dinner since it was clean. On the more realistic side of testing I’ve also used this layer throughout the winter. 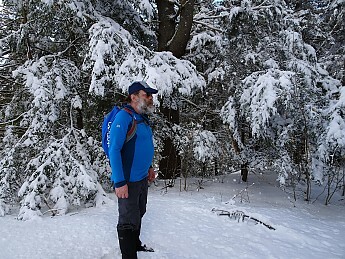 Day hikes, local snowshoeing, multi-night outings and even actual winter mountain summits were the main testing. The shirt was also worn around the house for a large part of the last few months to simulate wear and because it feels cozy. Snowmelt about ready to be turned into coffee and breakfast in NH's White Mountains. As mentioned often in this and my other reviews, I am a steam engine. That means that when hiking under load and especially when climbing, I generate a lot of heat and moisture. This impacts how insulation works for me and I try to take that into account when writing my reviews. 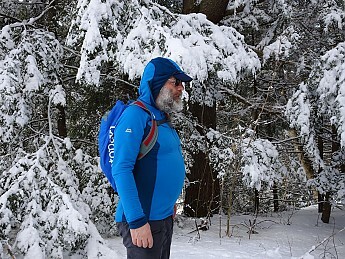 Other folks may find they need more layers to keep warm and should do some testing of their own before taking on a serious adventure with this garment. I wore the Eclipse alone on warmer days or when there was no wind. The only real negative I could come up with for this review is that the dang thing can be too warm if I get carried away romping around in the snow. A base layer starts against the skin and this one feels great there. The active fit wants to squeeze gently against the body, yet the flexible materials and stitching allow the shirt to wrap around body parts that may not conform to the “active” ideal. That close fit never seemed to be restrictive or annoying. I felt free to move but enjoyed the snug feeling of the fleece. 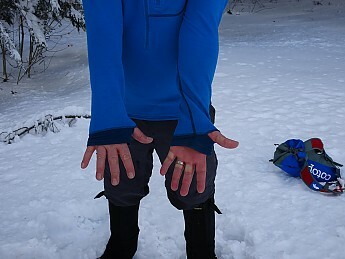 Neither the sleeves nor waist did the annoying climbing thing that many fleece base layers tend to do. As a fur bearing mammal materials that climb get good traction on my skin and can lead to exposed skin below along with binding and friction issues where material collects above. This just didn’t happen with the Mountain Equipment Zip Tee. When I tried wearing the thin wool layer inside of the Eclipse I was surprised to find that it didn’t work for me. I’ve worn the WoolPro shirts inside of quite a few things and always found it comfortable. Being a steam engine I enjoy the anti-stench properties of wool as a base layer, but in this case it was rapidly clear that it was in the way. 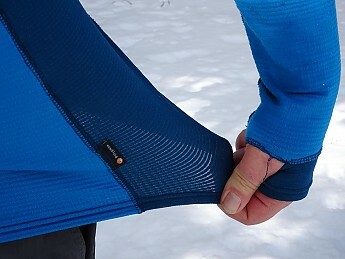 The grid fleece was able to do its job much better with direct skin contact. Given the chance to do that job it was amazing how well the fleece could move sweat away from the skin. Again, I am a steam engine putting out a lot of vapor and sweat when I climb no matter the season. Generally I expect my base layer to be a bit soggy after hours of heavy activity and rely on mid layers to move the moisture out. I carry several of the thin wool shirts so I can swap them out at lunch or as needed in that case. With the Eclipse I was noticeably drier on long days. There was little of the soggy feeling even when I overworked and got things really steamed up. Even wearing the shirt alone to shovel snow and getting it soaked as falling snow melted on me didn’t result in the wet clammy feeling one might expect. I guess my point here is that while it isn’t supposed to get soaked with sweat, if you manage to do it the shirt still works. The ability to dry fast goes hand in hand with that. Whether on your body or draped over the pack the fleece seemed to dry very well. If overheating resulted in wetting it was easy to vent quickly via the zipper and then reduce activity to allow the fleece to dry out inside the shell. Head, neck, shoulders, torso, arms are all fitted closely as the material stretches and gathers as needed to wrap around various shapes. That flexible material moves with you in all directions while active. A shell is all I needed to use with the Eclipse most of the time. Adding anything more would be too warm for me for active use, but between testing at home and in camp I found that adding layers for inactive use worked well. The Zip Tee didn’t have a lot of extra material to get trapped inside additional layers and become annoying. Working on camp chores, sitting in camp, and even as a sleep layer it worked well with others and felt comfortable on the skin. While this product fared better than most synthetics I’ve subjected to stench testing the Polygiene anti-microbial technology was not able to completely subdue my microbes. I followed ME’s recommendations as far as washing; minimal washing with minimal soap, no dryer and in general had good results. The fleece really seemed to soak up soap fragrance so it was easy to remember not to use much which helps keep the fleece uncoated and able to do its job. With light, day use smell was not an issue. On multi-day trips where the shirt got sweaty numerous times there was some of that famous synthetic stench, but again, better than many I’ve worn. Left unworn it did seem to lose its stink without washing, so that Polygiene stuff seems to take a beating and continue working. While the Eclipse Hooded Zip Tee looks pretty, it is a serious bit of kit and doesn’t come cheap. Extended testing has shown it to be quite durable so one could expect it to last I would say. Given my experience I’d also say it is worth the investment for those who would benefit from the qualities I’ve outlined in this review. Prior to testing this shirt I might have thought otherwise, but my experience makes me feel it is worth the price. Based on that experience as a whole I feel comfortable recommending the Eclipse to those considering a purchase. 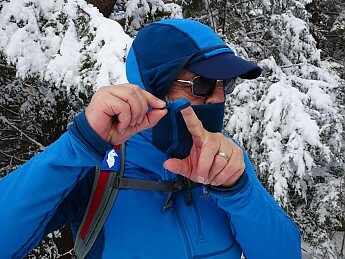 Really helpful to read about the hood and how it plays nicely with the long, off-set zipper. 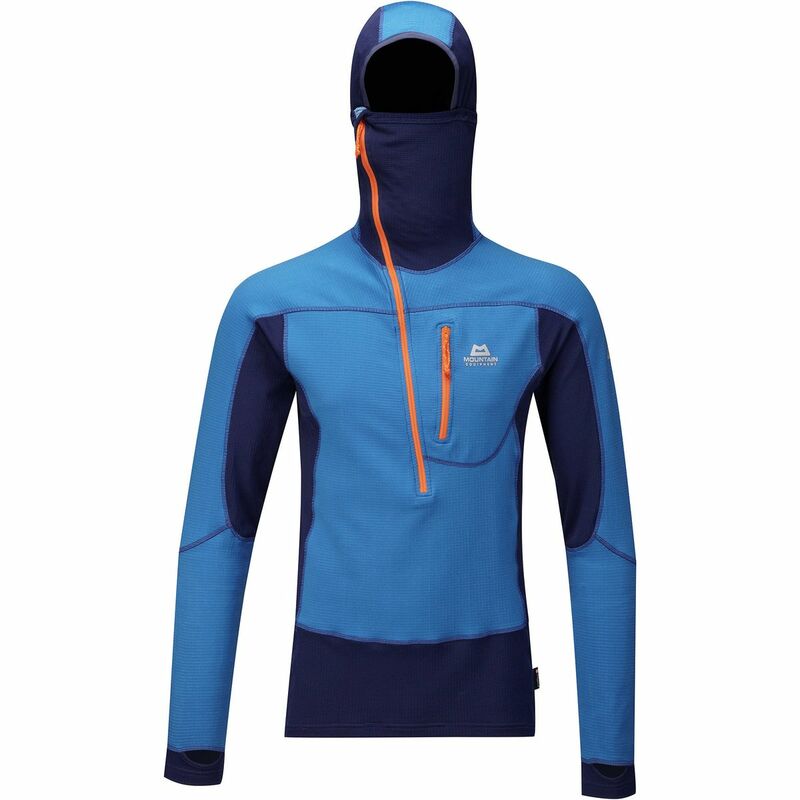 Garments like these tend to either be really uncomfortable on the throat when fully zipped or the hood is practically useless. Seems like this one has the right balance to negate those issues. It seemed they reworked this product over the years to get that hood right Kiwi. In my research I found folks talking about excess hood getting in the way of helmets. Always nice to see good products being improved to be better products! LS- I don’t have the money to buy more stuff! Stop it. This makes me want one even more, great review! Great review, LS! And those pictures on Baldpate this winter made me happy. The photos really help out with the description of the hood...I shy away from hoods but that one might just suit me. 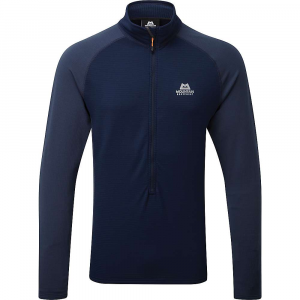 Great grid fleece mid layer or cold weather base layer for active use. 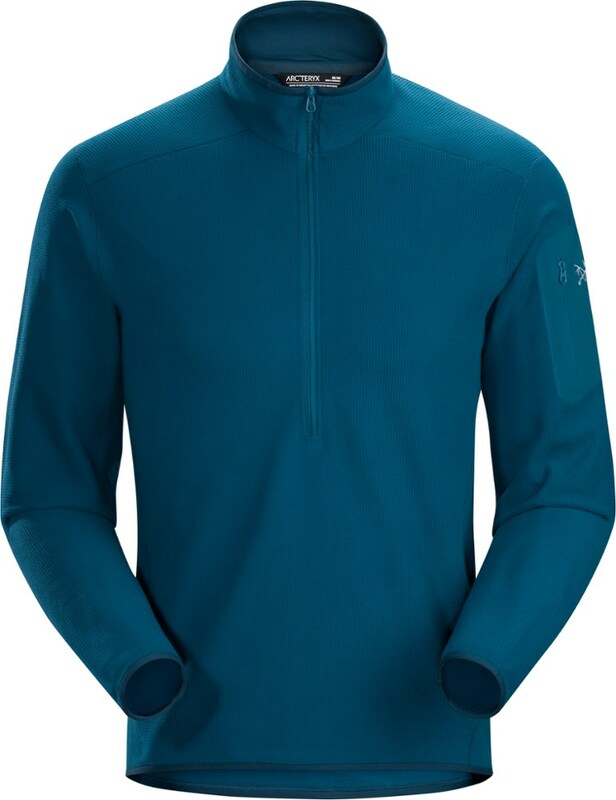 Of the grid layer fleeces Patagonia's R1 is the one you see the most mentioned. Mountain Equipment's Eclipse Hooded Zip Tee is I think a slightly thinner improved version with some nice details. The fit allows for a bit wider shoulders and a slim, athletic body. Of course it fits non-athletic bodies as well, just size up. 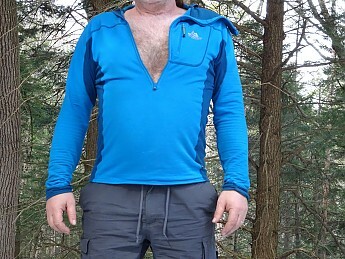 What I mean is that when I get an R1, I feel more restricted in the shoulders with a medium, but with a large it will fit loose around my torso, which doesn't help with the wicking. The Hooded Zip Tee has a long torso that will keep your back covered, thumb loops that will keep your wrists covered, and a great balaclava style hood. The very deep zipper (useful for venting when postholing or pumping up a steep slope) is asymmetrical. It starts from the middle of your torso and goes to the side of your face so the zipper pull is not in front of your mouth or nose when you pull it all the way up. Very nice detail (see image below). The top of the hood itself is not very close fitting to the forehead. It seems to not come down enough, or not have enough elasticity there to really protect your forehead from the cold. This surprises me a bit because it is clear a lot of thought has gone into this garment. I am 184cm and 72Kg and my Medium is a body hugging fit and weighs 295 grams. The arms come all the way to your knuckles, while the hem (tucked inside pants) covers your bum well. In short, the coverage is great. The Eclipse Hooded Zip Tee is made out of Pontetorto Technostretch fleece, an Italian grid fleece alternative to Polartec PowerDry. I have to say I do not know which wicks better, or which is warmer for the weight. I have many items made with PowerDry and love them, and I love the Pontetorto Technostretch as well. More important I think is the weight/thickness of the grid fleece used, and your intended usage. For me this fleece is a better option than my R1 jacket because it is a bit thinner overall, and has zones with different fabric thickness. The torso is thicker, while the sides of torso, inside of arms, and the hip area are thinner (see darker areas in image above). This helps you sweat less when very active, while protecting your torso enough in the cold. I normally wouldn't use this fleece unless it is under -10˚C (14F), probably colder. I have used this straight as a base layer, or layered over another thin layer. It works fine/feels good either way. The R1 is warmer and I have not used it as an active piece because it is too warm for me. For slower treks or post trek layer the extra warmth of an R1 can be very welcome. What I find great about grid fleeces like this, and the Eclipse in particular, is it really does wick very well. That being said, when I climb fast in the cold I do find you can wet it out. The fabric seems to work well, but is no miracle. Especially with a pack on, it is hard to avoid a wet back when working hard. The good thing is, it really doesn't seem to matter while you are active. Even when wet, it feels dry — and warm. I have had to check my back several times during runs or climbs to find I had a bit of a wet back. But even at those sub-zero temps I was never cold. Because of grid fleece's great breathability, even more so than with other fleece the wind will go right through it. I don't think I have ever used this or other grid fleeces or shirts without a more windproof layer on top. You might find this a hindrance, or not. Personally I really like it this way, because you can get rid of the fleece if you're overheating, while keeping the wind protection. This item also comes in a jacket (full zip, no hood) version. This fleece, if properly (body) fitting, will not be a convenient piece for around town. If you want to get double use out of it, a full zipper version is easier to put on and off, and a bit looser fitting jacket would be nicer to wear over regular clothing. When you get the right size this garment is all performance. I have always gone for hoodies with half zip for the most warmth/coverage vs weight. What I find though, is that I do like to bring two balaclavas so that I can put a fresh dry one on, and dry the wet one out if necessary. If I were to buy this fleece again I might find myself go for the hoodless version. Although this version does give very very nice neck protection even if not using the hood. All in all a great active piece, that in my humble opinion deserves to be more known, used and abused. Great review Jakachu! I've always been really interested in the mountain equipment stuff, all looks really well designed, but the shipping cost to me in Canada keeps holding me back. Big fan of mountain equipment stuff. Every item I have had from them has been fantastic. Thankfully it often ends up on sale here in the UK! Interesting design, seems to fit my preferences really well. Thanks for the review, Jakuchu! Thanks! Glad it is of help. If you can find it on sale it can be worth it even with the shipping. Best fleece ever made for winter climbing. I had to get this fleece after using my fried's on a on a climbing trip. The fleece has a snug athletic fit. The fabric transports sweat away from the body well. After using it on several trips I am impressed with it. 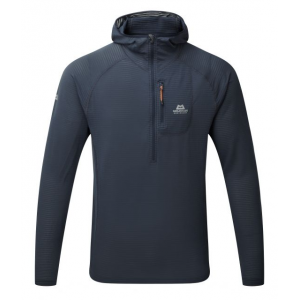 The hood is thin, but adds the needed warmth to the neck when the chilling wind tortures you while belaying. The hood feels OK under a climbing helmet and follows the head nice. Thanks for the review, Ludvig. You said it is an athletic fit. Does it run true to size or a bit snug? True to size, but a slim fit. Very elastic so should fit most.